It’s hard not to focus on just the next 2 gameweeks of DGW34 and DGW35. That has been my immediate focus but I’ve tried to temper it with the fact that there are 3 gameweeks after that. That’s particularly relevant for GW36 where either Salah or Mane is likely to be my triple captain vs Huddersfield unless I decide to go for Man Utd v Huddersfield in GW37. It means I have to carry over a transfer in GW35 to get Salah for GW36. I have thought of keeping Salah this week as they have Cardiff in GW36 and I may still do but it doesn’t half cause problems for the rest of the team. Also I’m bench boosting in GW35 so there are no makeweights only players who can contribute points. 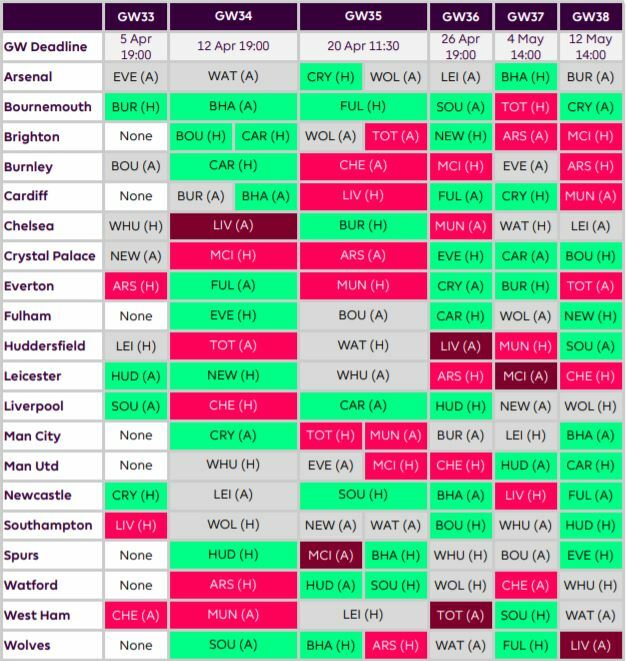 Every player except maybe Liverpool players will have 2 games in GW35. One of the problems I have is who will be the polls captain favourite in GW35? I really can’t pick it. I can’t see it being Kane with City in there. I could see it being Aguero which would mean a team redesign. With a double gameweek in GW34 Ryan is pretty much a certainty in the team for me. The question is who else of the Brighton team could be in it. Home games to Bournemouth and Cardiff do suggest a double up in defence but Ryan is the only representative of the GW34 double gameweekers at the moment. Wolves and Spurs in GW35 do negate the attraction to some extent which is why I’m hesitating to get more. A game against Huddersfield in GW35 is an attraction. The Watford defence is tricky though as selection is a bit hit and miss. Foster is a certainty though so he gets the nod. In someways a placeholder as I’ve got money invested in him and there’s no alternative jumping out. The immediate fixtures question whether Man Utd or Man City are worth defensive representation although that is tempered by the fact that there are 5 potential clean sheets out of 6 games after that for both Manchester teams. But I’ve balanced that against the fact that Liverpool could easily get 2 out of the last 3 so it’s in the too hard inbox at the moment. If I go for a City defender it would be Laporte. Man Utd Lindelof I expect. I have some hesitations about the Spurs defence and the price is totally disproportionate for the clean sheet and Vertonghen’s attacking ability but the Huddersfield home game just keeps flashing away at me so for the moment he’s in. I just can’t see Trippier playing both double games even with Aurier injured as for all Walker Peters problems he could still make an appearance. I will defer to Spurs fan Joseph Crilley on that point. Won’t stay and a placeholder only for the moment as I’ve got a decent amount of money invested in him. Could be for a Brighton defender if I feel brave. Good value and reasonably good attacking prospects. It’s just whether Southampton can keep clean sheets. I have some reservations about Martial as he is very hot or cold. He did play well against Watford. However he was a sub against Wolves which means he must start against Barcelona in the UCL otherwise I won’t be considering him as a first choice Man United player. I really like Mkhitaryan as an alternative but Emery being Emery hasn’t started him in the last 2 before GW33. Mkhitaryan did start against Everton though. However double Arsenal (as I want Lacazette) seems to be asking for trouble. The last double showed how difficult it is to pick a City player with alot of rotation going on. The paradox is that the more difficult the fixtures the more likely that Pep will play the first choice team. That gives hope for Sterling going into DGW35. I would probably think Aguero will play both games given that Jesus has been a little up and down but I’m finding it hard to move away from Kane/Jimenez and one of Lacazette and Aubameyang for my front 3. Other than Sterling the City midfield even with the fixtures is tricky. De Bruyne is a hard one to guess as his injury history could suggest Pep will be careful but on the other hand he’s played very few minutes so fatigue isn’t an issue. Will Bernardo Silva play both games in the double as another alternative or will the 3 of Bernardo, David Silva and De Bruyne play 1 game each or can you guess which one will play 2 games. Again that shiny fixture of Huddersfield has drawn in another Spurs attacker. Alli or Eriksen that is the question? I probably need to do a bit more thinking before I decide on 1. Certainly Maddisons goal against Hamer yesterday gives some hope to Eriksen. However it all depends on Alli’s position. The last 2 games he’s been way too deep for me. The reemergence of Son puts some question mark against Alli’s position especially as a support striker which is where you would want him. I’ll either go with him or Redmond for this cheap spot. Ward Prowse in there at the moment as it seems his price will rise soon so I’ve put him in to avoid having to pay more if I ultimately do want him. I marginally prefer Redmond as he plays CAM or as a striker but his stats are pretty ordinary and he is a pretty wasteful finisher. I would like Deulodeu in as a cheap option with Huddersfield playing but he’s on the bench vs Wolves in the FA Cup which is no surprise given that Gray has been in such good form. Do I like anyone else from Watford enough to put them in for 1 fixture. Not really. Doucoure has really come to the fore in the last 2 with great shooting volumes and underlying stats. Is that a sign of the future or just 2 games. It’s hard to say. With Huddersfield next there’s no question here for me in having Kane as he’s likely to be a massive captain favourite. That’s it for the moment. I will update it as I go this week with maybe little mini articles. I have 3 Spurs attacking options in my squad with Kane, Son & Eriksen. I can see a rout against Hudds and they can score in both of the DGW fixtures, especially in the home tie against Brighton who have been poor lately. I want a Watford attacking asset for sure given those fixtures in the DGW. Delofeu is the obvious option. I have no idea why he was dropped for the FA cup semi, as he wasnt exactly playing poorly of late. In any case, he stole the show today so surely will be back in the lineup. I have also put Deeney in too, but may switch to Jimenez as double Watford attack may be overkill, but maybe not. Lacazette completes my strike force. I have Ryan and Duffy for Brighton with the idea of swapping one out with the FT GW35. GW36 I plan to swap Eriksen for Mane for that home tie against Hudds and captain him. Pogba and Kolasinac are holders for now. I have no City attacking coverage right now which is a worry. 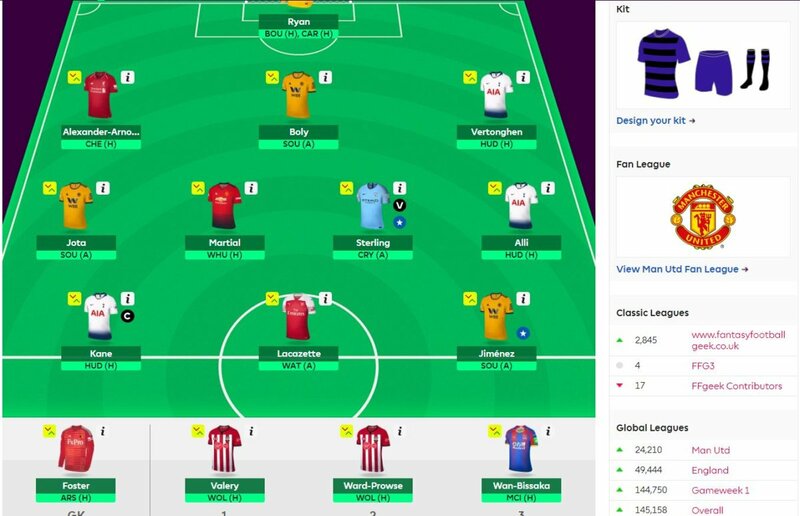 I may swap Kane out for Aguero in GW35 and just abandon the whole double Brighton defence strategy GW34. 1. Ryan and Foster both have tough fixtures at the same time (after the doubles). Have you considered Gunn and Ryan as they complement with 36 Ryan home New; 37 Gunn away WHU, 38 Gunn home HUD? 2. Why is your TOT midfield query Alli/Erikson and not Alli/Erikson/Son? 3. Why wouldn’t you just avoid Martial for now and focus on MUN as a transfer closer to GW37? My reasoning for Foster was around the difficulty in picking someone in the Watford defence who will play 2 games and wanting a Watford clean sheet for the Huddersfield game so Foster was the only realistic pick. I think 37 is unfortunate but a sacrifice I’ll make for the double. If Deulofeu had started in the semi I probably would have had him in the midfield but he didn’t. Does his 2 goal heroics change the position for him playing 2 games I don’t know. Martial is a bit of a placeholder which possibly didn’t come out strongly enough in the article. Don’t get me wrong I like him but he’s very hot and cold and will be binned if he doesn’t start against Barcelona. If you don’t feel brave enough to double Brighton def I like Lloris,Duffy over Ryan,Verthonghen. Brighton are at home to Newc GW36 and Watford at home to Wham GW38… hardly tough fixtures. They are both tough GW37 alright, but I wouldn’t be concerned about one game week. I really like this team apart from the absence of a Man City player. It seems like a huge omission to not have Man City representation, but then I also really want to keep Salah (I’m TC’ing him in GW36) and it is impossible to predict who will be rotated or not by Pep. Eurgh. I personally like Mendy and KDB as City options for the coming weeks. Especially Mendy. He was back to whipping balls across the box this weekend, and with the injury status to Zinchenko, Walker, and Delph I would back him to get a lot of minutes.